I wrote this shortly after my return from New Orleans in March 2006. 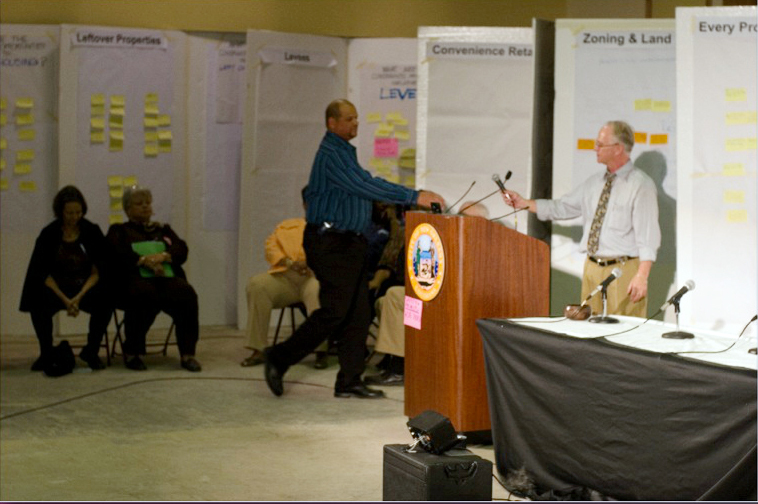 Over a March weekend in 2006, I was in New Orleans to assist a professional facilitator with a Vision Retreat process for the hurricane-damaged neighborhood of Pontilly. Pontilly was the first African American planned development in America. They broke ground in October, 1956, the year and month I was born. They would be celebrating their 50th anniversary this year if Katrina had not intervened. My job is to provide transcription services as the day progresses. A team of architecture students and urban planners want to begin working with our session’s results as soon as Monday morning. I am also under contract to help the facilitator write a book about his experience. So I am here as a combination of secretary and biographer. We arrive at the Pontilly Vision Retreat just before 9:00. Cars are parking on the lawn of the Greek Orthodox church where we’ll meet. Reunions of separated friends and family are taking place all around. The activity level is intense: 350 people have come, most from out of town. The church took on eight feet of water. Repairs are underway — drywall dust is everywhere. Bert emcees the opening prayer, song. Then we have reports from “experts” – the Police Chief and the Sheriff, men from the sewer and water board, the school superintendent and so on. Five minutes each. They speak in quick rotation; attendees write questions for them on sticky notes. Volunteers collect these. While the group moves on to a “Mads Sads Glads” exercise, the volunteers sort the questions for the experts. About 11:00 the experts take the stage again as a panel. A moderator now reads the questions. The room suddenly feels like a tea kettle about to boil over. The moment passes. Bert Stitt calls a local official to the podium. 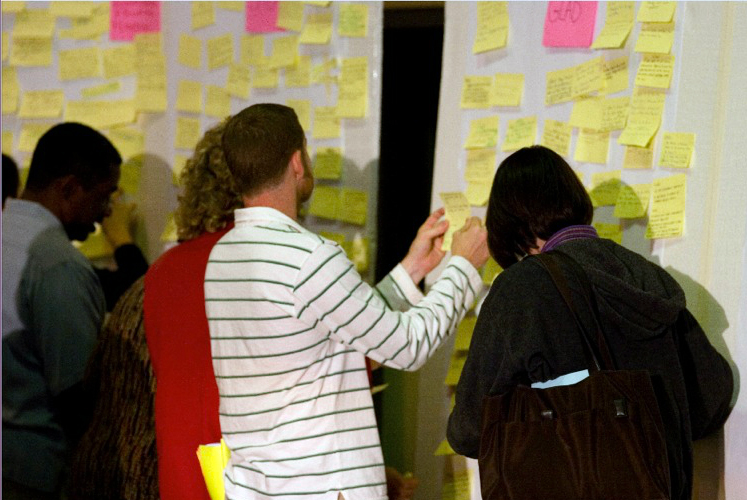 While the experts are grilled, the volunteers sort the “Mad Sad Glad” sticky-notes by theme. At noon I begin working with Linda Stitt and Kathy Wilson, transcribing them. Kathy reads the Mads, Sads, Glads to me from the big rolls of butcher paper as I type. Heartbreaking work. I’m mad I can’t go home to my own home. My children can’t play in their backyard. I’m mad that all my fruit trees gone. All five of my pets are dead. I’m mad that I’ve lost my house and all my precious photo albums of family and friends. I’m sad about not being able to pick out my beautiful clothes. I am wearing the same thing over and over. I was born naked. I’m glad for friends and family, for support and a place to stay. Sticky notes at theme stations in progress. Politicians have heard about the meeting and show up, news crews in tow, to give “way to go!” soundbites from the podium. At 3:30 the final bell rings. Bert asks for the chairs to be placed in a large circle for the final report-back from the theme stations. Volunteers summarize what they have heard. Eighteen voices report the distilled essence of 350 people contemplating what they know, feel, and imagine for their neighborhood. We hear surprisingly practical ideas. For a moment I see a picture of an ideal place rising like a giant thought bubble above our heads. Bert brings back the reverend for a final prayer. The neighbors will have many a reunion tonight. I can’t sleep. By 6am I am already transcribing the butcher paper rolls created in the different planning themes from yesterday afternoon’s work. Use homes that are left abandoned — make them senior friendly and available to the elderly. Give golf carts for seniors. Create an affordable senior village with cottages for people who lived in Pontilly at one time. No high rise Senior Tower. Transcribing is weird, strenuous work, because I am in a tiny hotel room, my only workspace my bed, the only task lighting the two dim wall lamps on either side. I unroll a butcher paper until it fills the bed, sit on one side with my laptop, transcribe every note I can read from there, then move to the other side of the bed and transcribe the rest. It would be much easier with someone to read them out to me, but no one is up and this is my job to do, anyway. I want to do it, to earn my keep on this strange trip. These people have suffered so much. It helps to be a little uncomfortable myself. The Pontilly Neighborhood Association is a neighborhood organization founded in 1984 to address issues such as housing, crime, flood protection and zoning. After Katrina the role of the organization expanded to develop a rebuilding plan for Pontcharttrain Park and Gentilly Woods. The Pontilly Association initiated the formation of the Pontilly Disaster Collaborative. The PDC opened the Pontilly Disaster Recovery Center in July 2007. 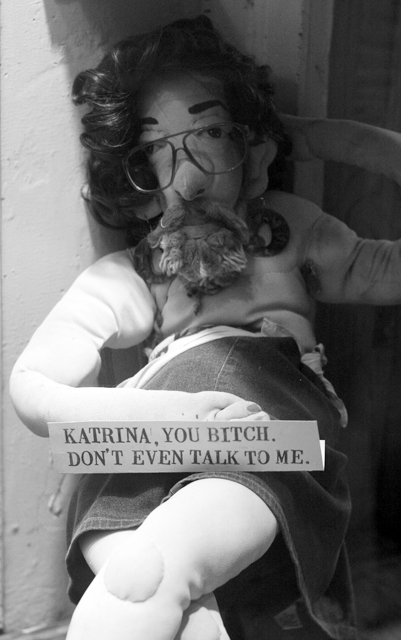 This entry was posted in Sarah's memoir and tagged Bert Stitt, Katrina, New Orleans, Pontilly. Bookmark the permalink. A fascinating glimpse into community engagement and in particular how the people of Pontilly were able to express their feeling, and have those feelings acknowledged, told by someone who was there, and who recognized their need. I also very much liked hearing from your point of view and hearing about the work you were doing there.